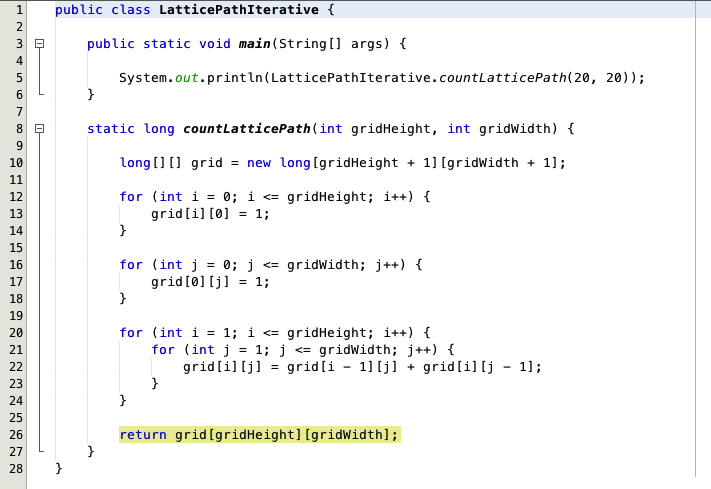 Apart from the recursive solutions an iterative approach for solving the lattice path problem exists as well. Again full credit goes to Pim Spelier. I really need to find this guy online. So I can properly link to him. 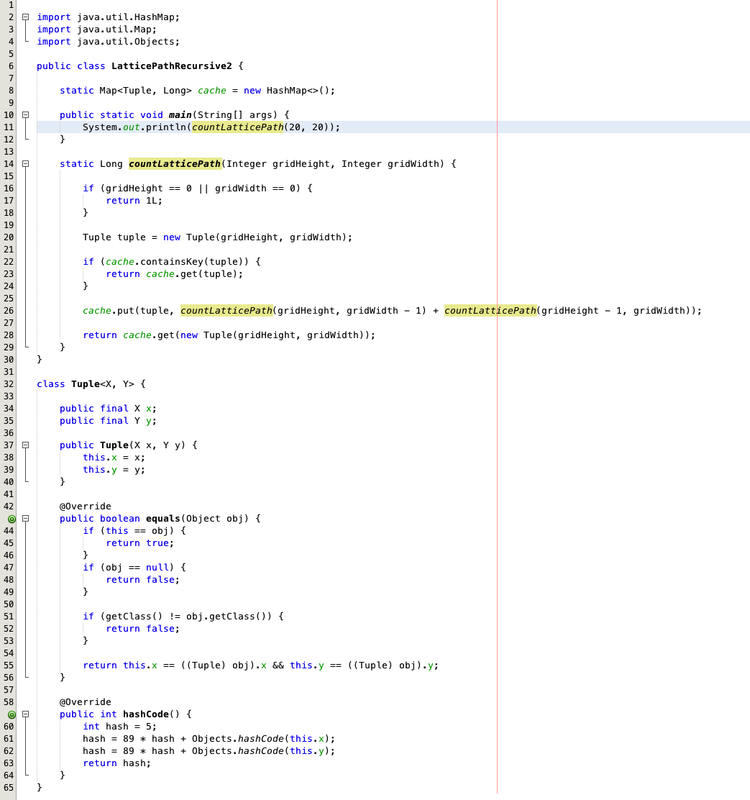 All my work is to translate the given algorithm to Java and dissect it in a way, so that I can understand the solution. The algorithm performs nicely within a blink of a second. Even if I increase the grid size above 20. First we create a two-dimensional array. 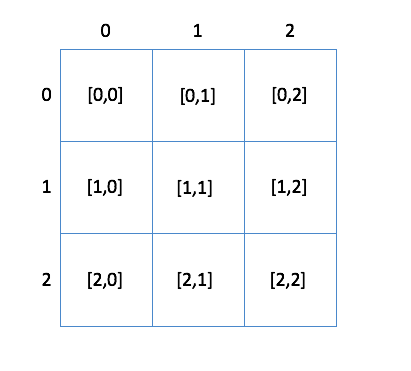 Let’s use the 2×2 grid as an example. Actually all grid cells hold an initial value of 0. 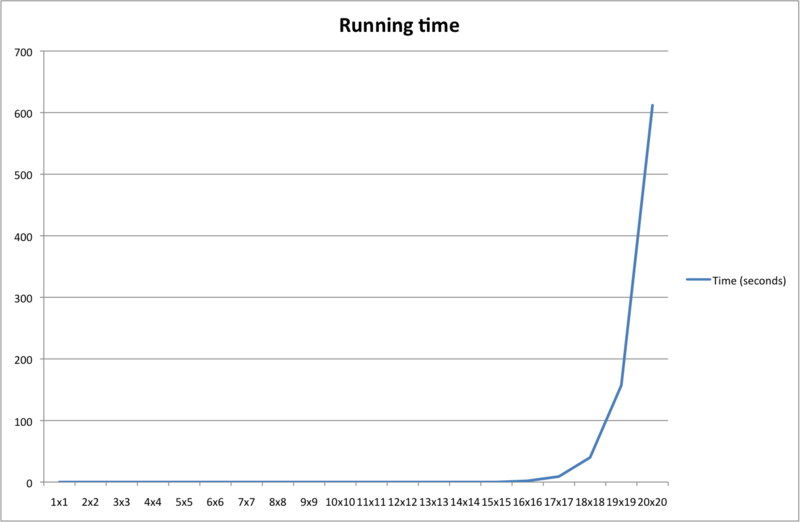 There is one more blog post to write about this problem. It will be about a combinatorial solution. This is how I spent my Monday evening. 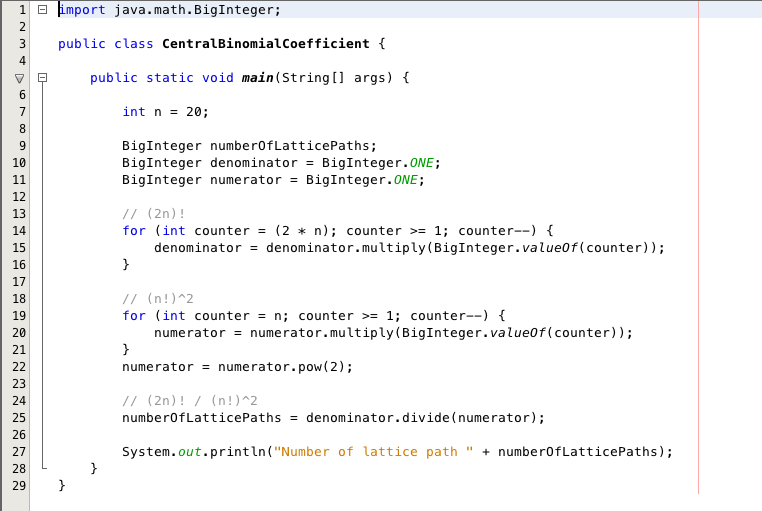 My blog post Project Euler – Lattice Path (Part 3) showed an implementation of a recursive solution to the lattice path problem in Java. Major problem was the performance of the algorithm. Working fine for small grids, but lasting forever for the actual 20 x 20 grid. 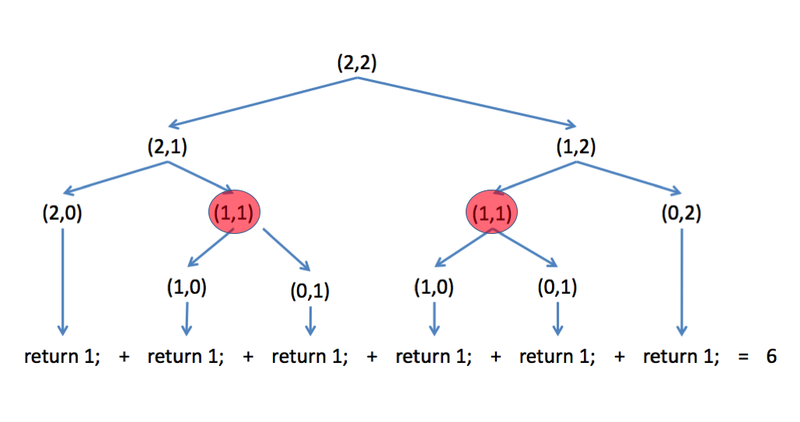 The recursive nature of the algorithm creates a tree structure. Unfortunately, already computed values are computed again. This is no big deal for a 2 x 2 grid. Only the value for (1, 1), which is 2, gets computed twice. But for a larger grid, walking all tree branches without a sanity check (“Hey, this road looks familiar. I must have been here before.”), the repeated recursive computation causes the performance issue. 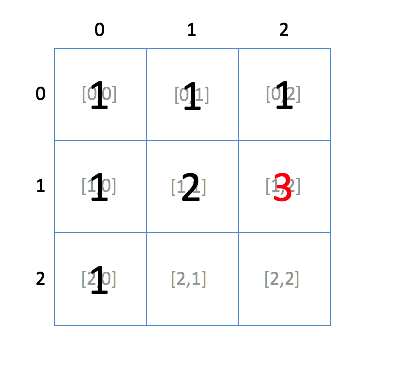 For a 3 x 3 grid the values for (2, 1), (1, 1), (2, 2) and (1, 2) have to be computed twice. 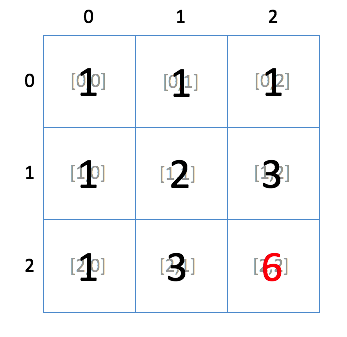 For a 4 x 4 grid it’s the values for (3, 1), (2, 1), (1, 1), (3, 2), (2, 2), (1, 2), (3, 3), (2, 3) and (1, 3). For a 5 x 5 grid…you get the idea. Et voilà, down to 0 seconds from previously 10+ minutes. 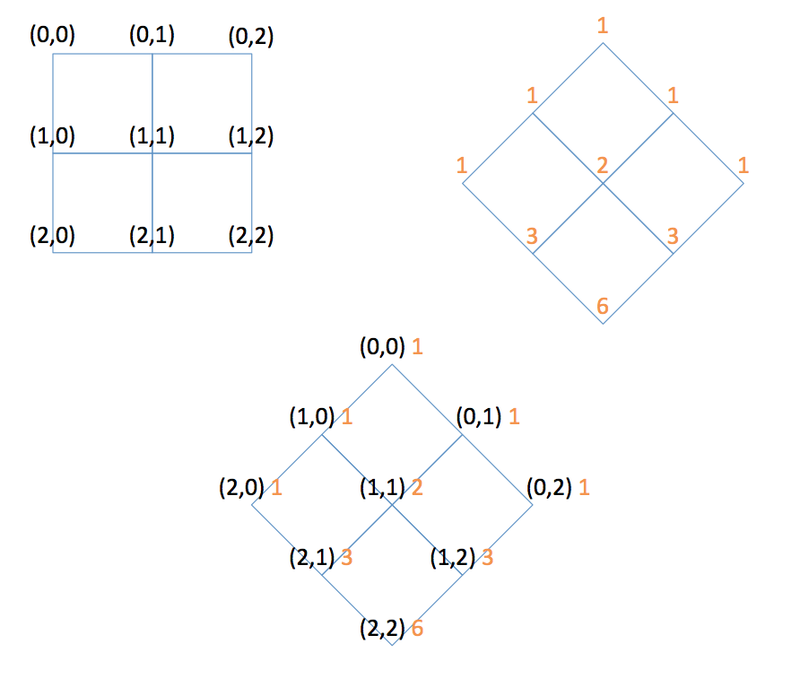 I use a 2×2 grid trying to explain a recursive solution to problem number 15.
Credit for the algorithm goes to Pim Spelier, who wrote a nice solution on Project Euler, which is downloadable as PDF once you have submitted the correct answer. The idea is to assign a tuple to each grid point, starting with (0,0) at the upper left corner. First row (0,0), (0,1), (0,2). Second row (1,0), (1,1)…you get the idea. The bottom right corner is (2,2). Now we turn the grid into Pascal’s triangle. Looking at the grid this way, it is now more transparent how the grid actually is a Pascal’s triangle. 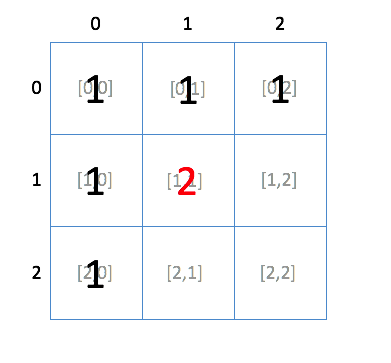 Starting from the top left corner, only one possible route exists to each grid point marked with a “1”. A grid point marked with a “2” can be reached by taking two different routes. 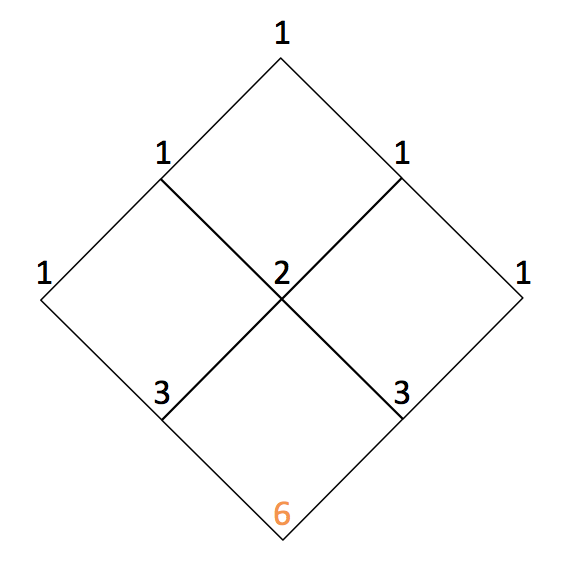 Guess how many routes lead to a grid point with a “3”. 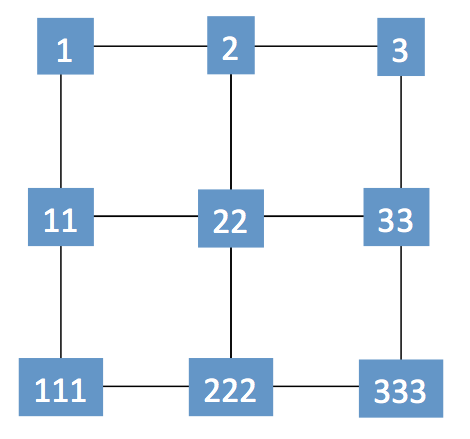 The number of lattice paths through the grid is the sum of the paths to (2,1) and (1,2): 3 + 3 = 6. You can see that for every tuple containing a 0 like (0,0) or (2.0) and so on, we must return 1. Every other grid point number is the sum of the two numbers directly above it. This leads to the following recursive algorithm. The function is called 11 times. Unfortunately this solution has a “minor” flaw, which is performance. Calculating the lattice path for a 20×20 grid on my iMac G5 takes over 10 minutes. A better performing algorithm will be the topic of an upcoming blog post. Based on the formula for calculating the central binomial coefficient I quickly hacked together some code. 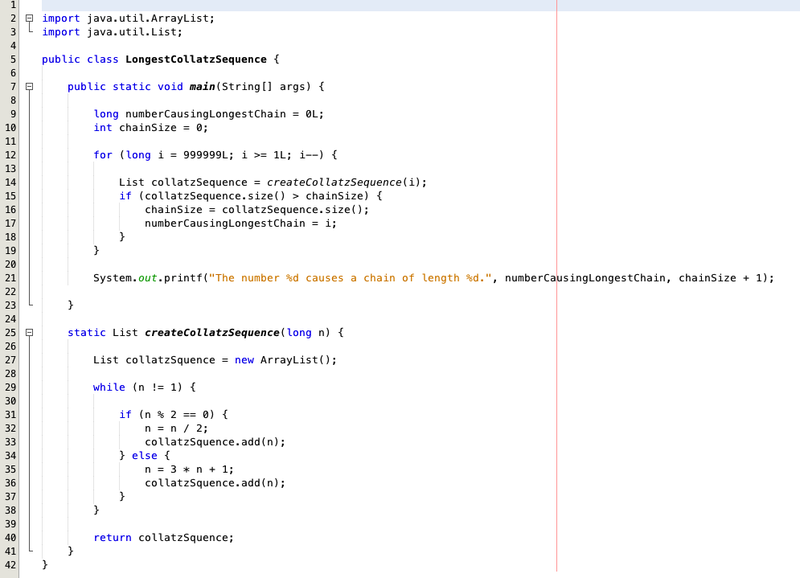 While writing this post I already know that much nicer recursive and iterative algorithms exists. I will turn them into another blog post. But first I have to understand those solutions. Arriving at solution is a process. I want to keep this notion of progress. Nothing is perfect right from the start. Analyzing forever will not get anything done. A neat and nearly perfect blog post in the end does not reflect the effort taken to understand this problem. It’s like social media where a picture posted on Facebook looks awesome to make everybody in your friendlist jealous, but is actually far from reality. I want to keep this as real as possible. If I make a fool of myself, so be it. At least I am a curious fool ;-). 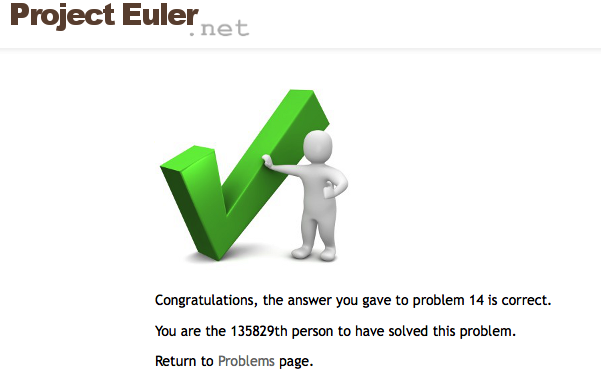 I first read about Project Euler on Scott Hanselman’s blog. After doing a couple of problems taken from the “easier” batch, just to not get frustrated right of the bat, I came across problem number 15 which I found intriguing. This one is a good example of how hard stuff can be without a decent mathematical background. And that’s when frustration hit me big times. Even though I finally figured out the correct answer, I cannot draw this particular problem to a close yet, as I am lacking a proper (implemented) algorithm. This blog post is a sum of what I know so far, including some failed attempts at solving the problem. I started with pen and paper, drawing a couple of 3×3 grids. 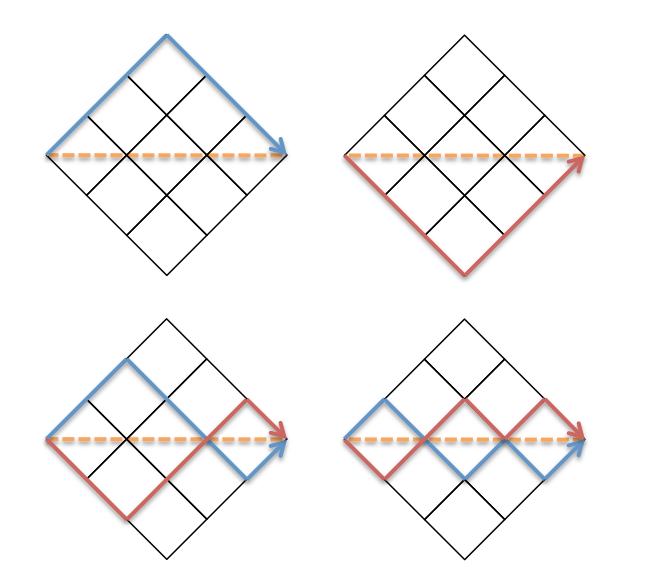 What I noticed by looking at the given example is that each path has a “mirror path”. Starting at the top left corner of the grid you can either move to the right or downwards. Wether you choose to move right- or downwards, all subsequent steps can be mirrored as well. Therefore it seems to be sufficient to determine all paths that start by a move to the right, and then simply double that number to get to the total number of paths. My 3×3 grid experiment resulted in 20 possible paths from the top left corner to the bottom right. The first 10 paths are shown above, all starting with a step to the right. I tried to derive an “algorithm” from the numbers I already knew. Guess what, I didn’t find one. Also drawing a 4×4 grid already looked exhausting. And to make it to a 20×20 grid…the problem’s author must have chosen that number for a reason. I restarted with a 2×2 grid and assigned numbers to each point of the grid. How many steps does ist take to get from the top left to the bottom right corner? Always four steps. E.g. (1, 2) (2, 3) (3, 33) and (33, 333). Or (1, 11), (11, 22), (22, 222) and (222, 333). Not all points in the grid are equal. From point 1 you have two choices (right or down). Point 3 only lets you move downwards. Point 333 is the bottom right corner from where you can go nowhere. I fiddled with these ideas for a while…stuck again. …accidentally uncover the correct answer without any further explanation. …copy a finished algorithm handed to me on a silver plate. I just wanted to get pointed in the right direction. 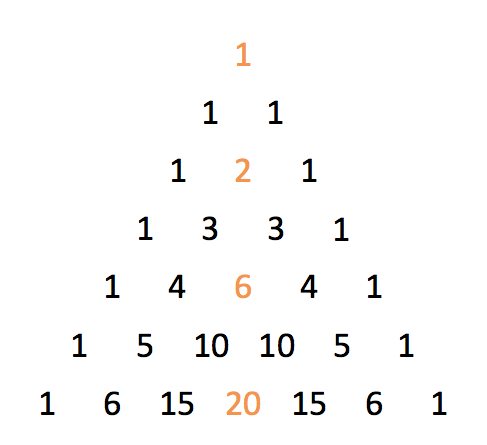 Looking at Wolfram MathWorld I knew I’d better start with Pascal’s triangle. 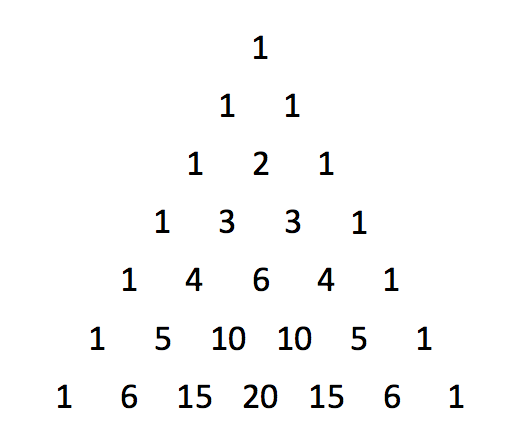 This is how Pascal’s triangle looks like. 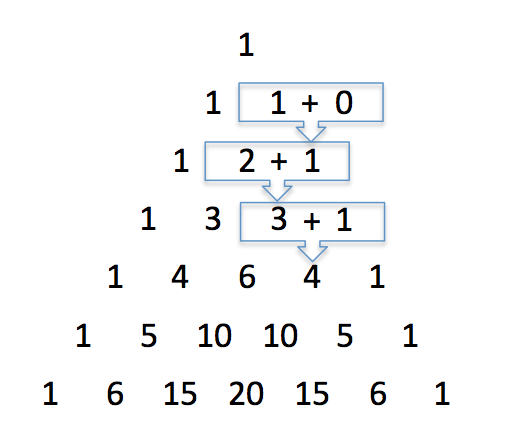 Each number in the triangle is the sum of the two numbers directly above it. Apparently the number of lattice paths through a grid are represented by the center column of Pascal’s triangle, the central binomial coefficient. 2 paths for a 1×1 grid, 6 paths for a 2×2 grid, 20 for a 3×3 grid and so on. Here, the 2×2 grid written as Pascal’s triangle. I consulted the On-Line Encyclopedia for central binomial coefficients and picked the 21st number, which was the correct solution to the problem. Now my task at hand is to figure this one out and to implement an algorithm.